Adverteasing is an awesome game of slogans, commercials, and jingles. Try to match products with their jingle, commercial, or slogan. Adverteasing comes with over 600 trivia questions. 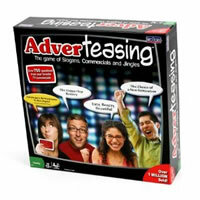 Adverteasing is a great game to play with family and friends. Match your knowledge with that of the other players to see who can remember the most. Take a trip back to your childhood days to see if you can remember the products and commercials. Play the party game Adverteasing today. To have a great time matching products with their familiar advertising slogans, headlines and jingles. Adverteasing will include the Adverteasing game board, 700 cards, 2 card boxes, 4 colored pegs, 15 second timer and Adverteasing rules and instructions. Place game board in a central location. Remove a card from the tray. Note each card has two sides; the slogan side and the multiple choice answer side. Correct answers are designated by a star. Readers should not let the other players see the cards. Each player or team selects a colored peg and places it in a hole on the game board section labeled start. Each hole or spot on the game board represents one point. The first player chooses a card and reads a slogan to the player or team on his or her left. Players should determine at the start of the game Adverteasing whether to read question #1, 2 or 3 on each card. Reader starts the timer. The guesser (or team) has 15 seconds to name the product identified by the slogan from memory. If correct, that player (or team) gets three points and moves ahead that number of spaces on the board. If the player or team cannot immediately recall the answer, all other players may shout out the answer. Reader will determine who answered correctly first. That player or team gets two points and moves two spaces on the Adverteasing board. If no one answers correctly, it's time for multiple choice. Reader turns over the card and reads the four choices to the original player or team - if this jogs the player's memory or helps him guess the correct answer - (choose one only) - player or team is awarded one point and advances one space on the board. The official Adverteasing rules state that if not correct, no points are awarded. In either case, the turns is now over and passes to the next player (reader) and play proceeds as above. The winner of the game Adverteasing is the first to reach president by scoring 25 points. We are on the hunt for more information about Adverteasing but have not found anything yet. If you have any information regaring the Adverteasing game rules or instuctions let us know and we will add it to this page. We will post any updates to this page as soon as we find it. Adverteasing Game rules and instructions. Share with us your comments, funny stories, tips, advice, strategies, creative ways to play, questions about how to play, problems with the rules or anything you want about Adverteasing. All submissions will be reviewed within 24 hours. Click here to add your Adverteasing comments. I have the travel game. How is the scoring done?